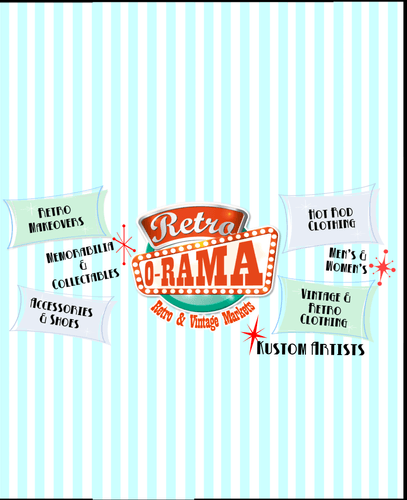 Retro America are proud to be bringing Retro-O-Rama to Americarna! Retro-O-Rama brings a bunch of awesome vintage, retro and hot rod related businesses to the best hot rod events around the country. You'll find something for everyone at Retro-O-Rama at AmeriCARna - guys, gals & kids! Come hang with us and do a spot of shopping or get a makeover with The Beauty School Dropouts. Straight Cut Clothing - NZ's leading supplier of hot rod, rockabilly and pinup clothing and accessories for all the family. The Beauty School Dropouts - Breaking the rules of traditional beauty, and taking modern vintage styling to the streets of New Zealand! You'll find Retro-O-Rama retro and vintage markets upstairs in the mezzanine area, next to registration at TSB Stadium Tues - Fri and in Currie Street on Saturday.